High performance and delivering top flavor and quality in every hit, the miniature Vapor Shark Minnow is a powerhouse considering its tiny size. One of the most intuitive and smart devices in the Vapor Shark range, this all in one vaporizer makes it easy to enjoy your favorite e-juices. Sleek, sophisticated and original in design, the Minnow is device that feels comfortable in the hand, looks great and delivers top performance. Measuring just 30 x 14 x 75mm it is a truly minimalist design but one which doesn’t disappoint. Powered by an integrated 650 mAh LiPo battery, the Vapor Shark Minnow delivers consistent power for each hit. It features a max VG compatible draw for huge cloud production and serious vapor intensity and flavor. However thick or premium your favorite e-juice, the Minnow can definitely handle it. The integrated tank holds 2ml of your chosen e-juice and the universal design of the Minnow incorporates 510 connections for easy compatibility with the most common and regularly used drip tips. Two additional mouthpieces are thrown in for convenience and the Vapor Shark Minnow is available in a range of different colors. The large viewing port make it easy to keep an eye on your e-juice level and high-vis LEDs ensure you can keep check on the charge status too. 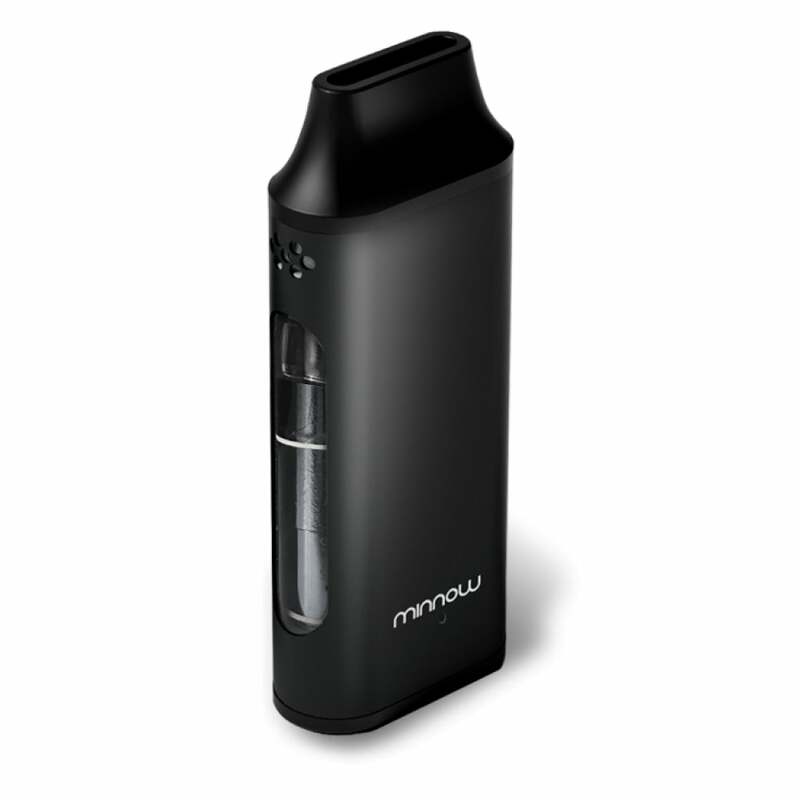 Switching to vaping is made easy with the Minnow all in one vape kit and the stylish design is also another big plus for people thinking of making the change. I've been using the minnow to quit smoking cigarettes. Works really well just wish it was a little bigger to hold more juice. Love my little minnow! This is my second. It is small so I can slip in my pocket or purse. It is made tough because I have dropped mine more times than I can count. Coils last. Easy and fast to charge! it leaks , every time you take a draw . Its compact size is great. I love hitting it without a button. I wish the hit was just a little harder, but I use 3mg nice, so with higher nic its probably fine. Overall it is pretty good, but my biggest issues is whenever you fill up with juice, its spots at you for like the first 5-10 pulls, then it is ok after that. But it sux having a mouth full of e-juice. Adjust air flow at every option, and it still happenes. Too small. I should have know. My fault. I like the vape I get with the minnow. It doesn't come with a coil attached and the instructions don't say anything about installing coil so i got a mouthful of juice until i finally found a YouTube video showing to install coil. It comes with 2 coils so there is one spare. Coils are unavailable on this site so not sure what to do when i need to change the coil. It may not matter as I think I stripped it out tonight. So although i enjoy the vape I am looking to replace with a different brand, I will check availability of parts before purchasing. I have tried everything and all I end up with is a mouth full of juice. I hate this product ! This little guy is awesome! Really has a good draw and I have bought several of them. I have found out you need to put an adhesive padding around base because the glass will break if you drop it. Otherwise the price point is a real deal! Super great little device, battery lasts forever and blows fat clouds. WOW....just WOW!!! Talk about a powerhouse. This giant shrimp will stagger you. I lowered my expectations for this gadget upon opening the package and realizing just how small it is. Literally fits easily within the palm of the smallest hand. The Minnows juice capacity seemed diminutive as well, holding just 2.2ml. I immediately grew concerned about it's ability to generate enough power or even retain a viable charge with what appeared to be a puny battery. WRONG! This little fishy is all about stealth. The cloud production on this tiny dynamo is easily the grandest of any juice extractor I've ever put my lips around. There's no power button either, it engages with your inhalation so there's no worries about reaching for it and being disappointed to find it drained when you realize that you'd either left it on or somehow accidentally engaged it. Good looking and sturdy too. Spits more than the icare and is also a bit too loose of a draw. If you use high nic salts your head will spin.